Thank you to Rennlist member J.Ho for sending us his absolutely beautiful 991.2 Carrera C4S for development at Soul Performance Products! Seeing this car come off of the truck in Pennsylvania after traveling from South Carolina was VERY exciting for us! We are going to develop and test various components allowing us to provide a great product to the community that will be backed by third party dyno data and thorough video/photo comparisons. This thread will be updated as we progress. In the meantime between updates, we are eager to hear from members with any product recommendations, ideas and other thoughts. We begin by evaluating and fixturing the stock components. And for dessert - a GIAC ECU Flash to pair hardware and software together for maximum power gains. 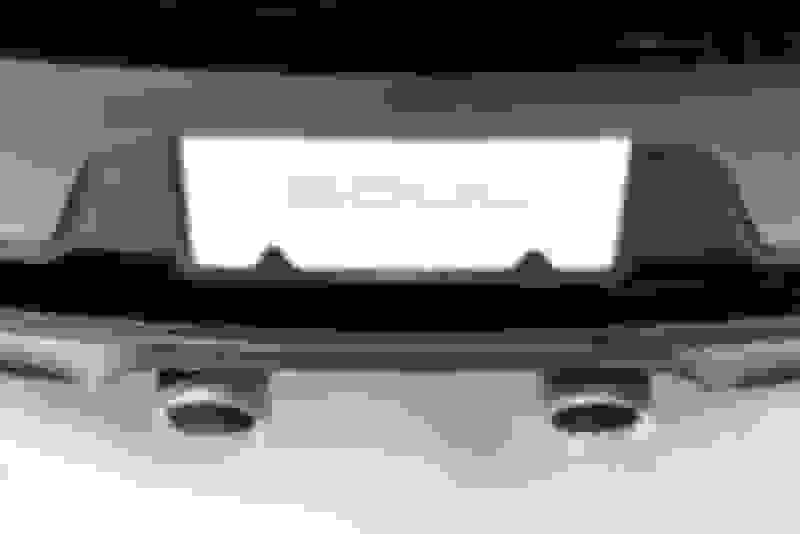 In the future we hope to continue development on a proper valved center muffler as a PSE replacement. We will be updating this thread with the comparison between the Soul Performance Products offerings weights, photos, video comparisons and dynos vs. OEM so stay tuned! Last edited by Soul Performance; 01-21-2019 at 11:31 AM. My pleasure guys. It's my hope that all 991.2 owners may benefit from this brief separation from my car. Can't wait to see what you guys cook up. The car was delivered to us with a custom made crossover center muffler delete made by a 19 year old friend of the owner. Our hats off for not only having the equipment to tackle that project, but to also complete it in a functional manner at such a young age. 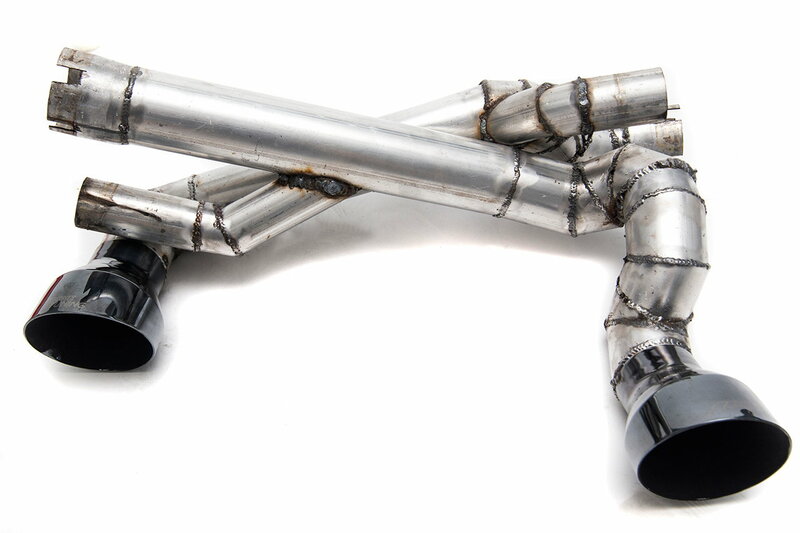 We have opted to develop our own Center Muffler Bypass X-pipe to pair with our catalyst replacement sections. Speaking of catalytic converters - we evaluated the best way to design a replacement that is easy to install, provides an increase in performance and response while still maintaining emissions readiness with no CEL. 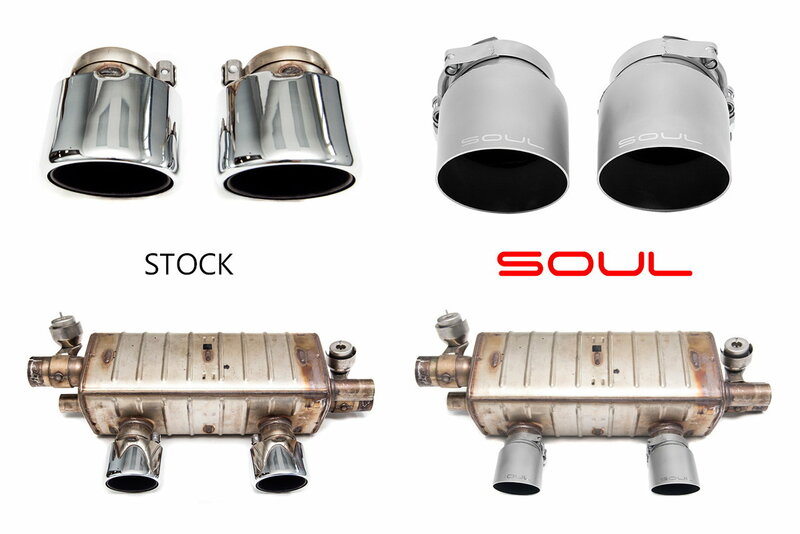 HJS HD 200 cell large diameter catalytic converters allows us to deliver on the promise of emissions ready replacement Sport Cats that reduce restrictions after the turbos. 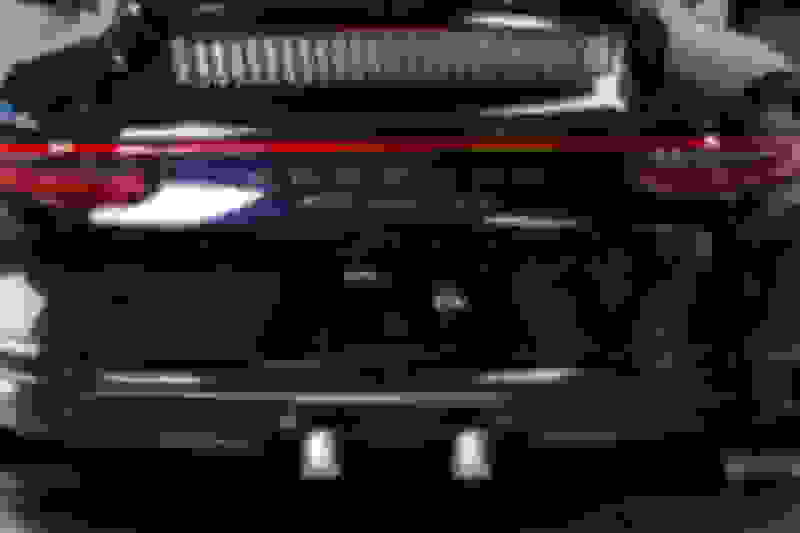 This results in an increase in both engine and turbo sound, providing better spool time (not an increase in lag), and more horsepower and torque. Using the best quality materials available however is only half of the battle. Having the experience and the knowledge on how to correctly fabricate the product to the quality that a 991.2 deserves is often overlooked. 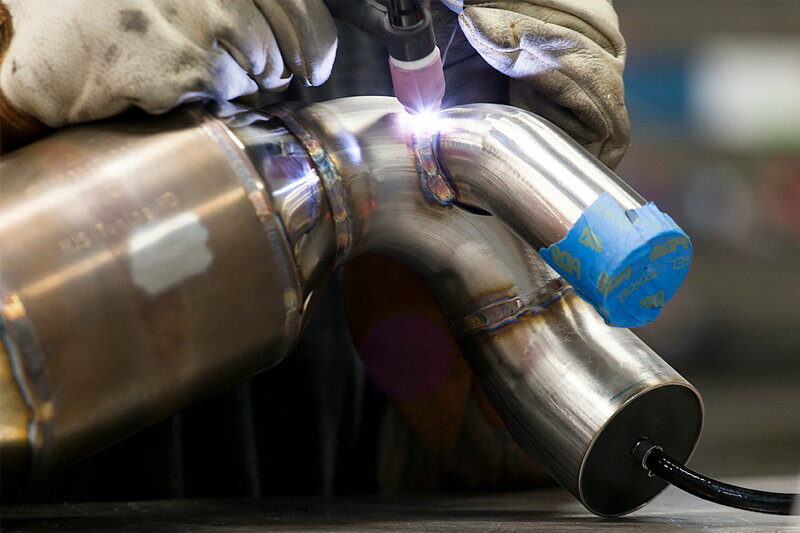 We utilize TIG welded joints with a 100% argon gas back purge to ensure that the penetrating weld is contaminate free leading to a stronger and longer lasting weld. Stainless steel is susceptible to contamination from oxygen, water vapor and other gases/vapors that can combine with the metal to form a compound that can compromise the integrity of the weld. When TIG welding stainless steel the outer portion of the weld is shielded by the flow of argon gas through the tip of the welder however the penetrating weld is not. We back purge the inside portion of the weld to ensure that it is thoroughly shielded from all angles and will not be contaminated. Key points when back purging can be seen in the photo below. A key point when purging with Argon is that it is heavier than air. You start with the introduction of the Argon at the bottom or base of the product you are welding at a steady pressure. As the Argon fills the space at a steady pace it will replace the oxygen and continue to fill upwards towards the top of the piece. A small vent hole (seen in the painter's tape) allows the oxygen to escape and a pure and steady flow of argon to replace it. It is important to be sure that the piece you are welding is fully sealed with the exception of the small vent hole. It is this knowledge an expertise that allow us to back our Sport Cats with a Lifetime Warranty - and industry leading 3 year coverage on the HJS catalysts themselves. We could not curb our curiosity of what a 991.2 C4S would sound like with a true straight pipe exhaust and we thought you would be equally as curious. Using 3” mandrel bent tubing straight out of the turbo to the rear of the car and fitting single wall turn downs, this exhaust system is radical, simple, and ferocious sounding. Video to come tomorrow but in the meantime, what are your thoughts? We put a teaser clip on our Instagram @soulperformanceproducts so if you don't follow us there, stay tuned! Last edited by Soul Performance; 07-13-2017 at 10:33 AM. Great stuff! Looking forward to what you develop. I just listened to that quick video on instagram- it sounds pretty dam good! Those downward facing tips are ridiculous !!! Totally rad and different. Curious to hear the straight pipes running right off the turbos! Thanks! Those turndowns will help with coming in under decibel limits during track time. We're going to put together a video as quickly as we can, but in the meantime you can see a quick clip on our Instagram! Thanks, you should hear it in person!! 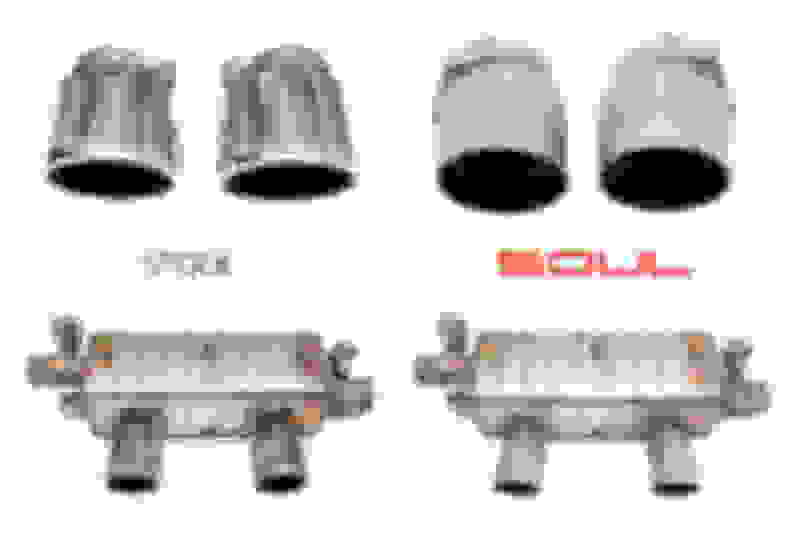 The O2 Space with mini catalytic converters will help with the CEL but as we know they can never be a 100% guarantee with the amount of variables. Ideally an exhaust like that it would be paired with a tune to get the most out if it while also turning off the CEL. 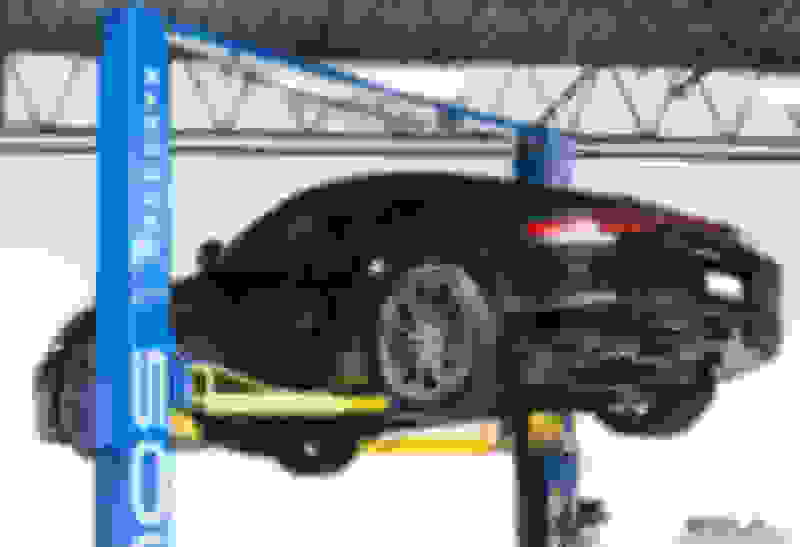 In my time as a Porsche Service Advisor I did not have any issues with warranty if the cars had hardware such as en exhaust. If the car is tuned it's always best to flash back to stock before going in for service that way they don't overwrite it and or flag it. In any event I'd say having a good quality relationship with your Porsche Service Advisor/Manager is always going to be a safe bet and not only for warranty but just in general. Last edited by Soul Performance; 07-13-2017 at 01:42 PM. I love the idea of the straight pipe exhaust! Would you be able to add the HJS cats to that so we wouldn't have to tune? Also, would you be willing to offer just regular tips to that as opposed to the turn down? this is cool. 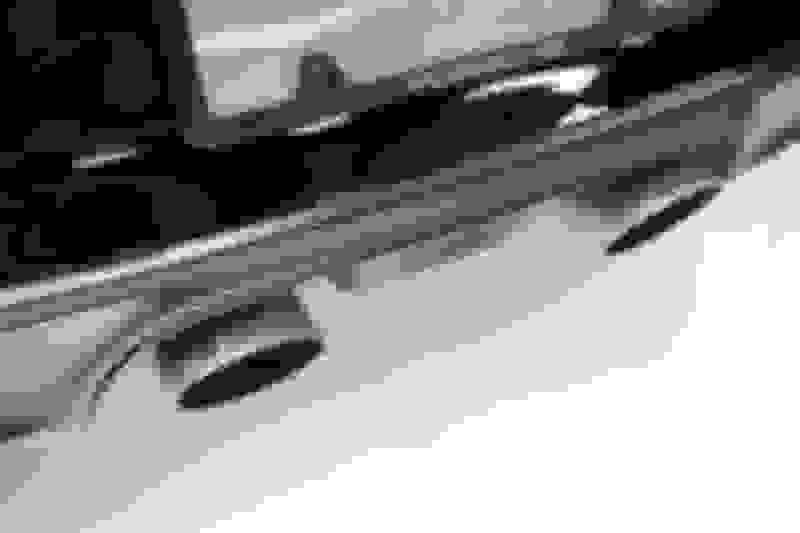 one question/observation: instead of having the 90 degrees bends in the pipes after the cat and then again before the tip, why not "flatten" out those bends to a less "straight/angular" bend (i.e., less degrees in bend) to make the pipe look more like a flattened "S" instead if the current arrangement. from the pic, it looks like there is plenty of space for it to work. 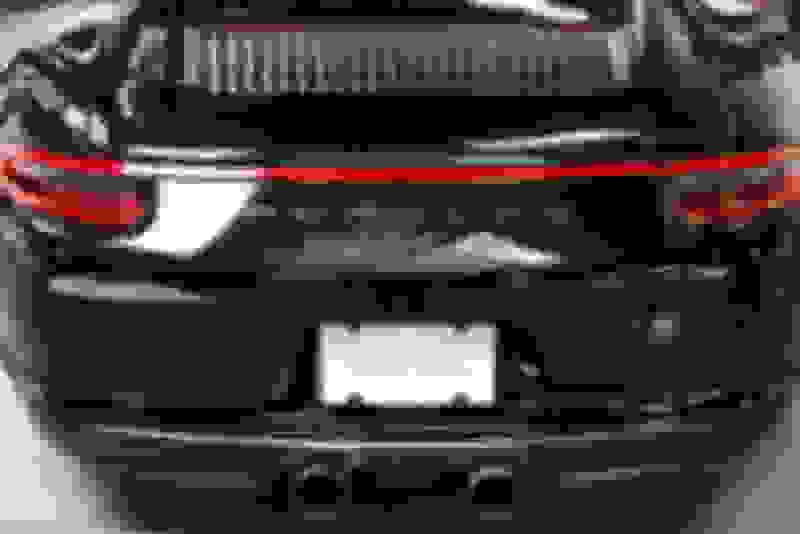 I would think the exhaust "air" will see the more flowing -less angular -- bends as more of a straight through design improving flow and exhaust escape velocity. further, a straight tip (instead of the downward angled one, which does looks cool and different) may improve flow more (one less "bend" for the air to maneuver). Last edited by tango131; 07-13-2017 at 01:26 PM. Glad you like it! We certainly can add HJS HD cats in! We can offer it with any tips you'd like. We can make the system so you can swap tips out - single walls for the street and turn downs for the track. Thanks! You are definitely observant and we appreciate you discussing the design. While there is plenty of space, a straighter path would require a new mounting solution. The prototype design mounts to the factory mount bracket via clamps. 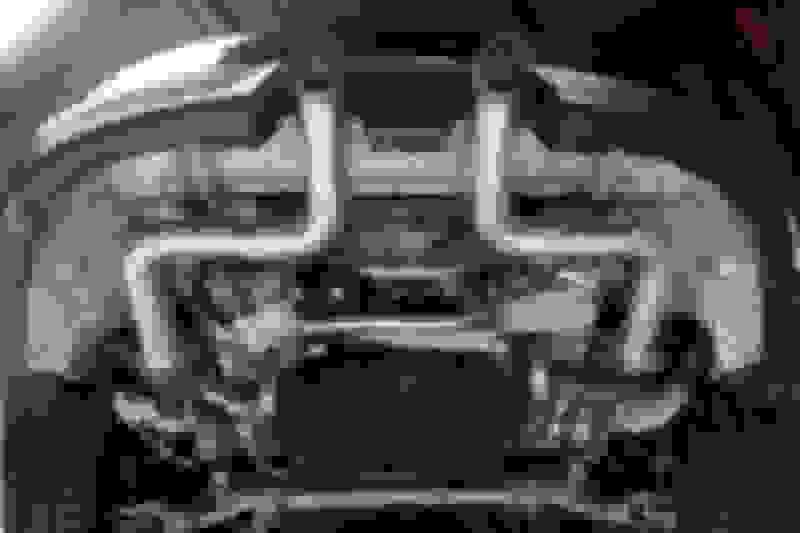 To support the exhaust pipes at a different point would require more engineering for custom brackets and that adds to complexity and cost. If we had more time with our development car we could craft something along those lines but we wanted to keep the design simple to withstand abuse, be easily reversible for quickly swapping out after track days, and back it with our Lifetime Warranty. We went with the turn down tips for the prototype to reflect the track oriented nature of the system, but also offer offer slash cut / straight cut single wall tips and dual wall straight cut tips. I'm about to take the car out in stock configuration to get footage of how it sounds from the factory to compare to the rest of our components. Stay tuned for another update later today! Really looking forward to what you develop- at this point I'm just looking for better tips for the PSE option. Love the sound of the Porsche Sport Exhaust but want to change the style of your exhaust tips? 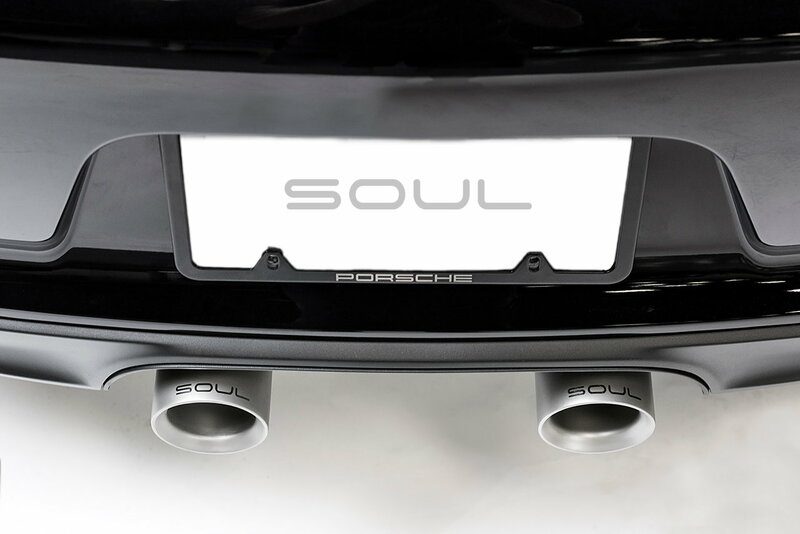 Soul Performance Products has an easy to install solution to increase aesthetics while retaining the stock PSE system! Choose from a wide range of options: Single Wall Straight Cut, Single Wall Slash Cut, Deluxe Double Wall, and even Turn Down Tips for the track oriented car. Change the look of your car in minutes by simply removing the factory tips then tightening the t-bolt clamps on the Soul tips. We utilize t-bolt clamps to provide adequate clamping forces around the entire exhaust pipe. Each tip comes with an internal ring which allows for play so that you can line the tips up perfectly in the bumper. The PSE system allows for around half an inch of play in tip depth. REFINISHING: If you ever need your tips freshened up, we’ll clean and blast them back to (as close to) brand new as we can for a small fee. CUSTOMIZATION: Interested in a custom logo at the end of your tips? We can do that! Want them longer or shorter? You got it. All tips are currently available. 4” single wall variants will be available soon. If you’re interested in a set you can PM me or check out on our website on the product page, here. Last edited by Soul Performance; 08-01-2017 at 04:34 PM.